SAS is a hybrid multitenant app with one part made in java hosted on GAS and the other part consists of android apps with different utilities. There are 3 types of login in web part – student/parent, admin and teacher. There are various functionalities in this system with the main motive of keeping parents informed about their children through sms. Though this is not all. Teachers can check the attendance of students, upload students’ marks, give homework and send sms to other teachers or students etc. Parents can check their child’s performance by logging into site and viewing attendance, homework and marks details etc. Admin manages all users, classes, sections, subjects, can view reports, send birthday, general, class wise, section wise, student wise or teacher wise sms etc. 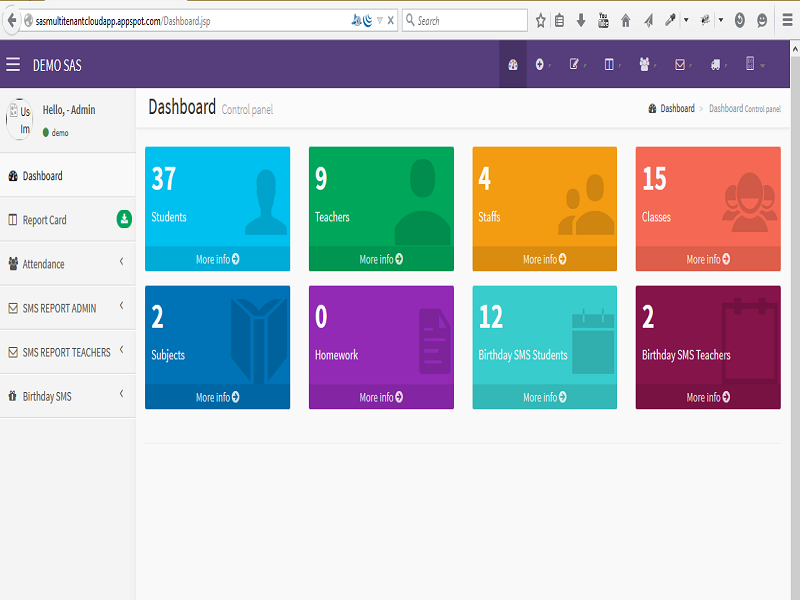 Android part has subset of the functionalities of teacher and admin. Each teacher of school is provided a tablet or smartphone through which he can take attendance, view attendance and send homework only if class teacher and other features i.e. send complaint, suggestion and add homework are for every teacher. This app can take attendance even if Internet connection is unavailable. It will send the attendance to the server as soon as Internet is connected and app is opened.